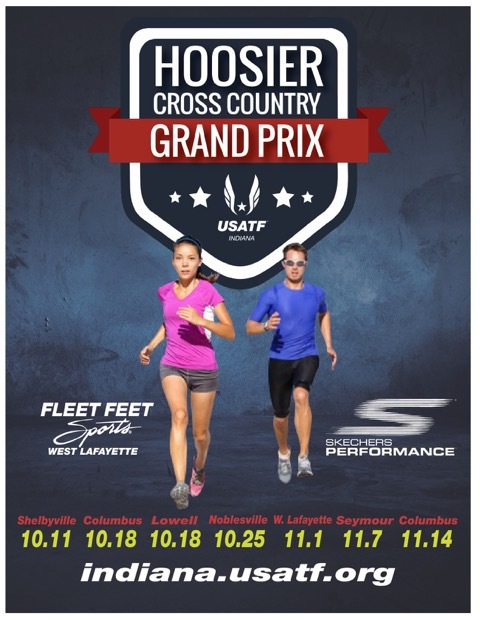 USATF Indiana is proud to present the second annual Hoosier Cross Country Grand Prix. The series consists of seven events across Indiana open to runners of ALL ages and abilities. The cross country distances range from 2K to 4K, depending upon age division. This is a great opportunity for elementary to high school aged runners to extend their season, and a terrific chance for adults to compete in cross country! West Lafayette will be hosting the 5th leg of the series on November 1st. The race will take place at the Purdue University cross country course, located just off of McCormick Rd. Click here for more information, course maps, and to register for the West Lafayette Classic. Registration is open to both USATF members and non-members. USATF members will earn Grand Prix points at each of the meets. Points accumulate towards a year-end Grand Prix score and placing. Click here to learn more about the Grand Prix points and scoring process.